Figure 1: Freya Stark in 1928. It is very remarkable phenomenon [the emerging young men of Egypt], for it is the first time in centuries that this country [Egypt] has not been governed by foreign rulers. Like the Arabs of Palestine, the peasants of Egypt are mostly immemorial inhabitants of their land, a product of many mixtures, with but a thin sprinkling of the desert conquerors among them; but the ruling Arabs through the Middle Ages were a separate exclusive society, followed by the more exclusive Turks. The Copts are most like the original people of Egypt; even now you can recognise their slender profiles and long-lashed black eyes, opaque and lustrous, in any pharaoh’s tomb. They still are one-fifteenth or so of the country’s population. They have kept the Christian religion taken from earlier conquerors, but they have long since adopted the Arabic language for ordinary conversation; and – as they are not what is called a “pressure group” – no one thinks of Egypt as they do of Palestine, or contemplates turning it back to the Copts to be as it was in the days of Titus, when his galleys sailed past Roman Alexandria towards Roman Judaea. Stark has good words for the Copts despite her gaffe that they have “taken [Christianity] from earlier conquerors”. But what is this about the “pressure group”, and what is the connection with Palestine and turning Egypt “back to the Copts to be as it was in the days of Titus, when his galleys sailed past Roman Alexandria towards Roman Judaea”? 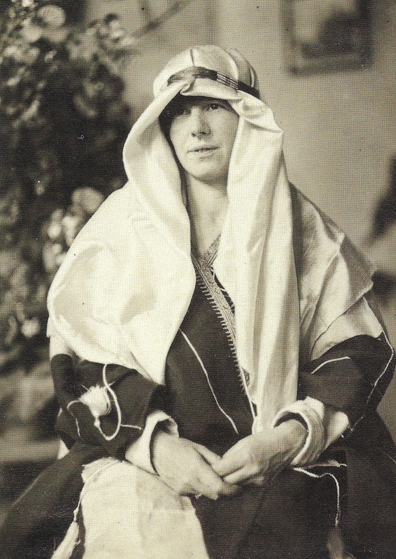 Freya Stark to those who don’t know her was a British explorer and travel writer (1893 – 1993) who wrote several books after travelling extensively in the Middle East, Turkey, Greece, and Italy. She was an Arabist and her books reveal that she fell in love with Arab countries. During World War II (1939 – 1945) she worked for the British Ministry of Information in Aden, Baghdad, and Cairo, where she founded the anti-Nazi Brotherhood of Freedom. It is not a secret that she worked for the British Intelligence during the war. She resisted the Zionist project in Palestine and revealed strong anti-Semitic feelings. This is particularly puzzling as when she published her book in 1945 the Holocaust was fresh in mind. The overriding motive for her might have been the need to recruit Arabs to the side of Britain in her war against Germany – and to achieve that she had to appear pro-Arab and anti-Jew. That may have been her immediate concern – there is evidence, however, that she harboured real hate towards the Jews. This may help the reader to understand what she meant by that strange sentence in the passage I have quoted from East Is West: Titus, of course, was the future Roman Emperor (79 – 81 AD), who led in AD 70 the Roman army in the siege and the sacking of Jerusalem, ending in the total destruction and demolition of the Jewish Temple in the city. NOTE: If you liked this article, read Part II: FREYA STARK’S EAST IS WEST, AND THE COPTS (II): RECRUITING COPTS TO THE BROTHERHOOD OF FREEDOM, here. Freya Stark, East Is West (London, John Murray, 1945). Her full name was: Dame Freya Madeline Stark. She was made Dame Commander of the Order of the British Empire in 1972. For more on her, see The Encyclopaedia Britannica. One can read Phyllis Chesler’s article “Freya Stark: Intrepid Arabian Adventurer, Ardent Jew Hater” for more on the Jewish perception of Freya Stark’s position on the Jews.